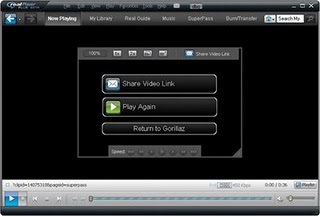 Real Player is a popular free media player and online web player for Windows. Real.com, the developers of Real Player offer three versions of the player for public usage. They are Real Player SuperPass, Premium Plus and free basic version. The first two versions are paid versions with some extra features like online movie subscription, editor, converter, DVD burner, etc. and last one is merely a media player. All of have the same installer, but you need to buy a premium package to activate additional features. The latest build of the Real Player is version 15 and is now available for download. You might think why you need to buy/download an extra media player as you already have Windows Media player pre-installed in your system. The following features of Real Player might prove it wrong. 1. Rip and Burn files to CDs or DVDs. 2. Download videos from video sharing sites. 3. Watch Movies and TV shows online. 4. Transfer music to USB, iPod touch, Zune or any other music players. 5. Share/ upload video files to online web services. 6. Convert video files into MP4, WMV, WMA, MP3, QuickTime, AAC, WAV, 3GP, RealAudio, RealMedia, and RealVideo formats. 7. Record and edit audio and video files. Real Media audio and video are the native media formats of the Real Player. Both formats provide near good quality media experience at a very low size. So they were popular online streaming format in the web before the widespread of the Adobe Flash Videos. Still you can find a lot of websites using the Real Player formats. And you need Real Player or a suitable codec pack for playing them. Download Real Player Basic (2012 free version) 15 full installer here. One commentator has posted an alternative method to download the up-to date version of the Real Player using the online installer itself. Have a look at it below, if you find the given link obsolete. Why you need an offline Real Player installer? Real usually provides an online installer of Real Player at their download page. Some of the users might find it not useful, especially when you need to save the file and transfer it to another machine. Furthermore, it is difficult to download the full installer each time after formatting/ reinstalling a PC. So the above download link would serve your purpose., it’s the full installer of Real Player 15 basic version. If you want you can opt for the premium service right after installing the software from within its interface. Where is the link my dear !!!!!!!!!!!!!!!!! Might want to actually put a link to that download here, chap. Ok we have updated the post. 1) Go to Real.com and proceed to download that “tiny” RealPlayerSPGold.exe (about 500KB; seems to be a customized download manager). 2) Double click that tiny installer and follow its instructions to proceed as usual. After click the “Alternate Installer” button, a dialog box (as shown in the first screenshot) appears to allow user download the 25MB standalone setup file that is good for offline installation. i have problem on downloading videos from youtube.i can’t see the button.can u help me how?